Eleanor, the daughter of a miner, was born to Bob and Peggy Stobbart in the family home in Arniston on the 17th March 1937 and was the first of their five children. In the early 1940’s the family moved to Newtongrange. Eleanor was a bright youngster who loved to dance. And it was at the dancing in the Newtongrange Masonic Hall when aged sixteen, she met Matthew Douglas, affectionately ‘Mathy’ who thought her so attractive and was smitten. Dancing continued to be a feature of their lives, especially in the Newtongrange Morris Club, which had a great dance floor and wonderful bands. 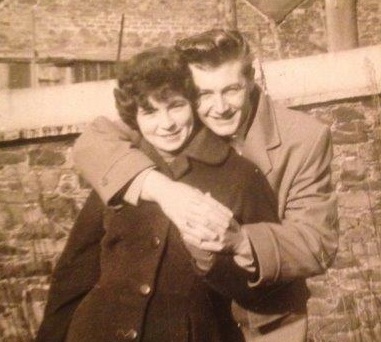 They married in Newtongrange church on the 15th February 1958 and enjoyed a honeymoon in Peebles which became a favourite place for both; they loved the Scottish Border Region. And making use of the partially revived Borders Railway, were regular visitors to Hawick for lunch on Fridays. Their marriage was the start of what would be such an amazingly wonderful family life. From holidays in Blackpool to that first two week camping trip to Spain, when they drove three days in Mathy’s bronzy / gold Avenger to get there; then three days back. Later there was their Spanish timeshare; which proved to be the key to fabulous holidays. Later in life she and Mathy enjoyed a fantastic month-long holiday exploring the west coast of America. This all began with their first home as a married couple in Eleanor’s parents front room, where they lived for about two years while Mathy was completing his National Service. They made their final move into their own home at 56 Blackcot Road Mayfield, some ten years later. Eleanor, always smartly dressed, with coiffured hair, worked full time; principally as a secretary with different companies. She was also a Registrar for a while in the Newtongrange Registrar’s office; and was always an extremely hard worker. There was a five-year break in her career when she and Mathy had their family of two; Lynn and Craig, she retired aged sixty-five. Some personal memories from Lynn include two of their mum’s favourite sayings; 'what goes around comes around' and 'what you put in you get out.' And their parents did invest lots of love and time in their family and they got a lot back. Eleanor was a great knitter for all the family and has left her workmanship in the way of shawls / knitted jumpers and beautiful hats intended for the great grandchildren. Her memory will live on in many different ways. She had many friends from all parts of her life; through dancing, Gorebridge Bowling Club, Easthouses Bowling Club, the Tuesday girls - now all in their eighties. Eleanor’s grandchildren; Ashley, Rebecca, Calvin and Amy remember her with such affection. Rebecca recalled; “My Gran, my greatest supporter, would always greet me with “Here’s my precious girl” and a huge smile on her face. I admired my Gran for the way she held herself. She always looked so glamorous and feminine. We had many holidays and nights spent all together, and later on, when the music started; if she wasn’t singing along and admiring my brother playing his guitar, she would be up dancing to songs (I remember one of her favourites being Mambo No.5). Amy said; “I loved Christmas at my gran and papas, Gran would feed us for three days solid, we had amazing meals where the whole family would come around and after dinner there would always be Praline Shells and After Eights’ which we would all guzzle, even though we were stuffed! She made everything so magical for us all!! Posted in In Loving Memory.